Venturing out of Cairo, though, to some of the less well-known places is an experience that is truly rewarding. South of Cairo, for example, is one city that repays the slight effort to get there. 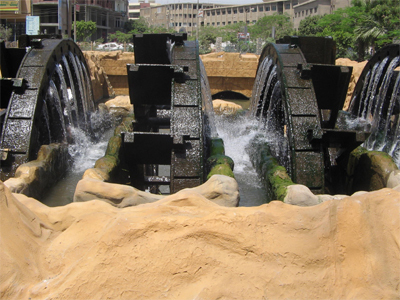 The famous waterwheels of Al-Fayoum have been turning for countless centuries. Day in, day out, since Pharaonic times, their mechanism of scooping water from the river channel below and lifting it effortlessly to water the surrounding fields, is as ingenious as it is simple. Al-Fayoum is, strictly speaking, not a true oasis, since it depends on its water source from the River Nile, which is brought from as far away as Asyut by the ancient Bahr Yusuf canal, running through the city of Al-Fayoum to this day. It is, nonetheless, a great expanse of greenery amidst the harshness of surrounding desert. Lake Qaroun is Egypt's largest salt-water lake, with an area of some two hundred and fifteen square kilometers. The water of the lake is forty-five metres below sea level and the whole Depression covers nearly seven hundred square miles. Once outside the city, though, the surrounding countryside is quite delightful, and well worth the drive from Cairo. Known for its all-year-round warm climate, Fayoum contains semi-nomadic Bedouin settlements and small fishing villages. The increasing number of visitors, either for the day or for weekends or even longer, can enjoy sailing, windsurfing, swimming and fishing on the edge of the desert. Desert safaris, by camel or by 4 x 4 vehicles can also be arranged. A former hunting lodge of King Farouq, which welcomed world statesmen such as Churchill and Roosevelt during the Second World War, is just one of the many hotels in the area. There are hot springs at Ain Al-Siliyin and waterfalls at Wadi Al-Rayan. The famous waterwheels, which are as much a part of the visitor experience as they are a part of the lifeblood of the oasis, were originally introduced by the Ptolemies in the third century BC. Repaired and replaced over the centuries, they remain today almost the same as they were all those hundreds of years ago, moving slowly as they bring life where no life existed. Pharaonic monuments, too, exist in the pyramid of Amenmhet III and the obelisk of Senusert II, but it is the famous portraits, now known to the world as the Fayoum Portraits, which are the masterpiece. Said to be the world's oldest portraits, painted on wood or stuccoed linen, to commemorate the dead, they were created to be enclosed within the dead person’s mummy, hidden forever from the world with their owners. In their timeless way, the waterwheels of Al-Fayoum remind us that all our rushing around will achieve nothing if it is not firmly rooted in the One who made all things. Egypt in these days needs a chance to calm down and reflect. Let the waterwheels of Al-Fayoum help all of us to slow down and to appreciate all of the beauty which is daily in our midst.